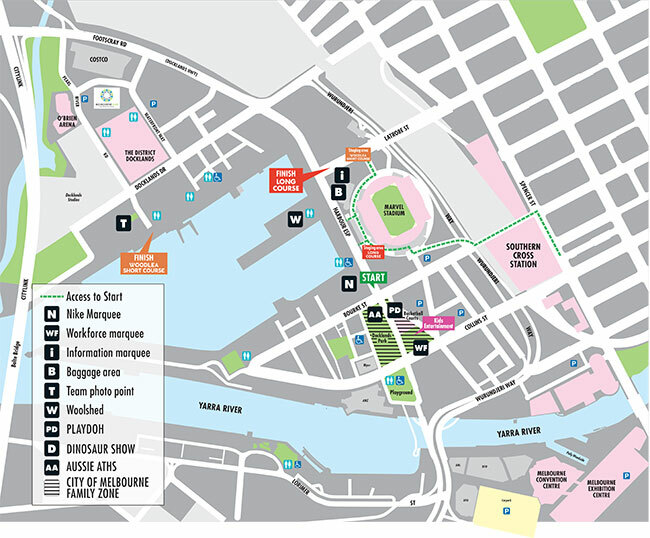 Our new home in Docklands has a brand new event layout, with a range of sponsor activations and family-friendly free activities along Harbour Esplanade waterfront and Docklands Park. Drop into the Woodlea Village activation and meet Woodlea Short Course Ambassador Sharni Layton (AFLW player and former Australian netballer). If you’re not too tired from your race, create a bike-blended smoothie and bring the kids for some crafty play. You can also cool off with a tropical orange icypole treat and hydrating H2coco coconut water. Plus pop by our epic photo moment and pose for a colourful and fun selfie with your run squad! Visit the Nike Pop up store on Harbour Esplanade between 8.30 – 12.30 to buy event merchandise. Nova 100’s Selfie Zone is back! Nova will be there to make sure you capture the moment you reach the top of the Bolte Bridge! Then join them at the finish line where their team will pamper you with a massage to soothe your aching muscles. will be in the crowd supporting runners at the start and finish lines, and giving away Mazda thunder sticks. Plus face painting, rides and roving entertainers, including a giraffe! Watch the Real Dinosaurs show, collect your free pop out dinosaur to make at home, snap a selfie with Gemma or visit the Playdoh Undersea Playhouse in the Community Hub and collect your free PlayDoh mat and undersea creature. Before or after your run, or whilst waiting for a family member to finish, bring the kids along to experience Aussie Aths – the best way to get healthier, fitter and faster. Give it a go in Docklands Park (cnr of Bourke and Harbour Esplanade). And don’t forget to grab a sweet juicy Modi apple as you pass through the recovery zone. For the first time, in 2019 we welcome the team from Melbourne Centre For Athletic Performance (or MCAP) Recovery Zone as our Official physiotherapy partner. If you need some advice on the best post-race recovery tips, be sure to visit the team at the Melbourne Centre For Athletic Performance (or MCAP) Recovery Zone. Their friendly onsite physios can help with post event treatment options and advice, and their Strength and Conditioning Coach will be on hand to provide warm down and mobility sessions.